Product #60830 | SKU WHD151 | 0.0 (no ratings yet) Thanks for your rating! 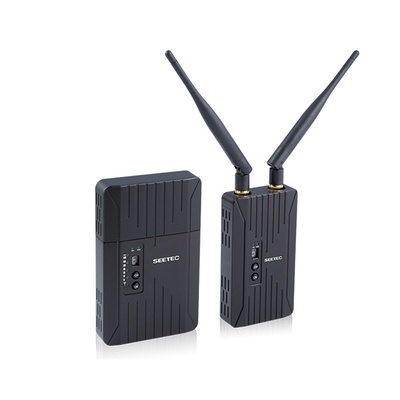 The Seetec WHD151 is the broadcast industry wireless system, and includes a transmitter and a receiver, with WHDI (OFDM) technology. The Seetec 150m SDI/ HDMI Wireless Video Transmission System is the broadcast industry wireless system, and includes a transmitter and a receiver, with WHDI (OFDM) technology, which supports uncompressed 3G/HD/SD-SDI and HDMI wirelessly transmitted in 150 meters scale (max 200m). It also features good stability and a strong anti-jamming capability under 5GHz frequency band. The system is pure hardware connection, plug and play build-up. It features an exquisite design, equipped with external SONY F970 battery mechanical interface for battery plug-in, which is widely used in film shooting, live sporting events, director monitoring, remote monitoring, live wedding broadcasting and forum broadcasting etc. Frequency Band 5.1-5.9GHz, configurable with China, North American, Europe, etc.